Innovative electric technology and an undiluted driving experience come together in Infiniti’s first hybrid, making its world debut at the Geneva Motor Show today. The low CO2 champion of the all-new M Line sedan range, the Infiniti M35 HYBRID steers the hybrid advantage from the city to the open road – and into the arms of all those who love their driving. A decoupling V6 engine, 50 kW (68 PS) electric motor built in to the 7-speed automatic transmission and exceptionally fast charge/discharge response from the lithium-ion battery pack all add up to a hybrid that’s electrically powered for more of the time, and at higher speeds, than conventional hybrids. The M35 HYBRID’S high degree of electric intervention results in the fuel efficiency and CO2 emissions of a smaller, less powerful car while offering the linear acceleration and unsullied rear-drive handling of a true Infiniti complete with all the charisma and potency of one of the great V6 petrol engines. Sharing the seductive looks, alluring cabin and world-first features of the all-new M Line flagship saloon – the first ever M to go on sale in Europe, also making its show debut in Geneva – the M35 HYBRID uses a front-engine, rear-drive-only layout based around an innovative drivetrain featuring a one motor/two clutch system. Innovatively, the first clutch is installed between the naturally-aspirated 3.5-litre V6 and the electric motor. This clutch allows the full decoupling of the V6 when in both electric and power regeneration modes – in order to reduce mechanical drag and boost the efficiency of the electric motor. Just how efficient the M35 HYBRID’s electric side is was shown in a rigorous test program in the US based on day-in, day-out driving over a three-month period on a route that took in not just busy city streets but also suburbs, freeways and even mountain roads. The results showed that the M35 HYBRID was able to drive in electric-only mode, with zero tailpipe emissions, for as much as 50 per cent of the time. Two new technologies are fundamental to the M35 HYBRID’s broad-ranging abilities. One is the lithium-ion (Li-ion) battery pack – quick to alternate between charging/discharging and, size for size, twice as powerful as conventional batteries. The second is the direct manner in which the petrol or electric power is delivered to the rear wheels. This “directness” is central to the M35 HYBRID’s overall efficiency as well as offering a consistent driving feel under all conditions. The M35 HYBRID’s transmission is an even more sophisticated version of Infiniti’s 7-speed Adaptive Shift Control (ASC) automatic transmission. One difference over the ASC transmission used in other Infiniti models is that there is no torque converter, and therefore none of the losses that torque converters cause. The lack of a torque converter also enhances responsiveness for a sportier-feeling drive. The throttle can be “blipped” just as in a manual transmission car, while acceleration is seamless thanks to motor-assisted gear-shifting that ensures ratio changes aren’t just eye-blink fast but also completely smooth. The electric motor is rated at 50 kW (68 PS) with 270 Nm of torque and is embedded within the transmission. The motor acts as both propulsion unit, either by itself or to boost the V6 in “power assist” mode when maximum acceleration is required, and also as a generator. As well as charging the battery in the normal way, the motor recovers energy otherwise lost during deceleration and braking. Apart from its fast charge/discharge response and 1.3kWh capacity, the Li-on battery pack is laminated to enhance the cooling performance. Temperature stability is further improved by the use of manganese positive electrodes. An end result of this is exceptional battery reliability. Light weight is another key advantage of the M35 HYBRID, with the compact battery pack, allied to the single electric motor, resulting in a 30kg weight saving. Power outputs and performance data will be confirmed at later date. 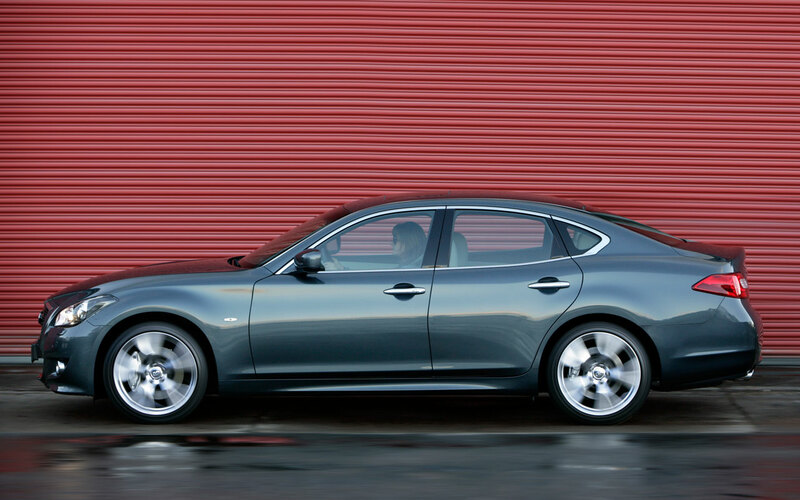 The new M Line has all the qualifications needed to be the flagship saloon for Infiniti and provide a distinctive and finely crafted alternative to timeworn German rivals. 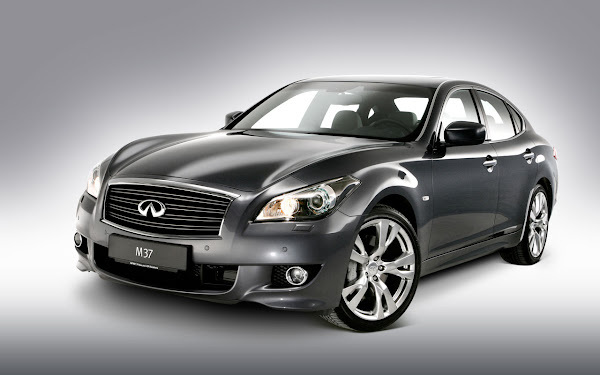 Classic sports saloon proportions and an elegantly flowing body go hand in hand with a spacious five-seat interior that sets a benchmark for quality and luxury even by Infiniti’s high standards. The M35 HYBRID, like all the new M Line models, has been engineered for European drivers and roads. Super strong, highly aerodynamic and based on the FM (Front-Midship) platform, the M35 delivers incisive handling matched by exceptional ride comfort thanks in part to the world-first use of double-piston dampers. The M35 in Geneva is shown in luxury GT form complete with semi-aniline leather and White Ash wood trim with silver-powder finish. Other M Line world firsts include Blind Spot Intervention (BSI) – a system that doesn’t just warn of vehicles in adjacent lanes but actively prevents the car being steered into their path – and a state-of-the-art “Forest Air” climate control system. An Active Noise Control system is also available.